Thanks so much for joining me for the Jedediah Shorts Sew-Along. I’m so excited, after all this preparation and after seeing how enthusiastic people have been about the pants pattern, to finally start sewing with you! We will be doing a progress post on Thursdays to Sundays for two weeks (so that you finish your shorts while the weather is still warm!) and will be concluding with a parade of your finished shorts and pants photos on Thursday, August 29th. If we are going too fast (or too slow) for you, don’t worry! The posts will remain as links on our Jedediah Shorts Sew-Along page for you to refer to whenever you would like and we would be more than happy to receive photos of your finished project (and show them off on our blog!) 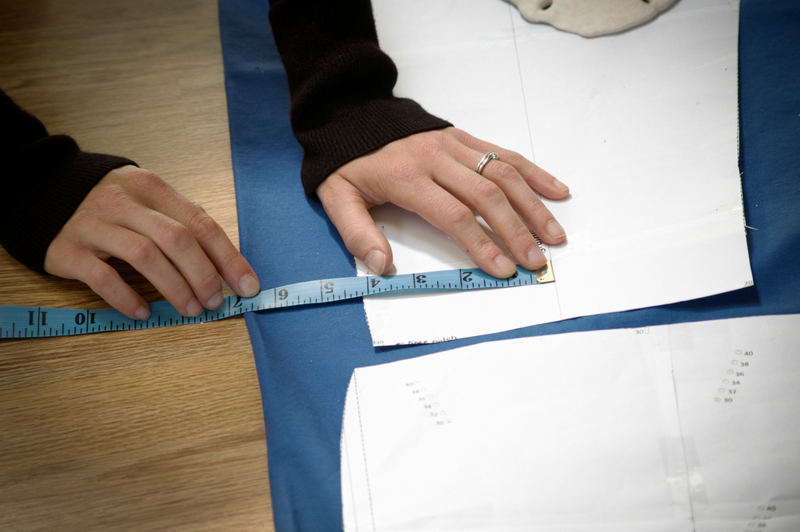 any time that you finish the sewing process…or can convince your wearer to model them! 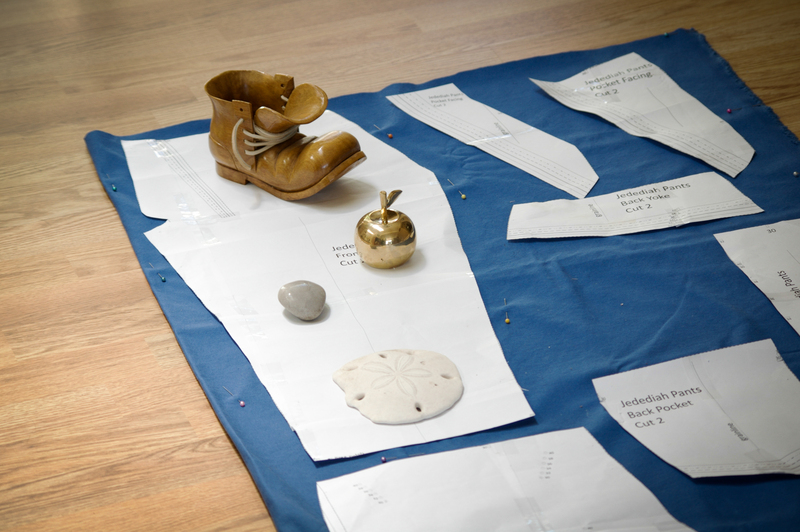 Today we will be cutting out the pattern pieces from our fabric. 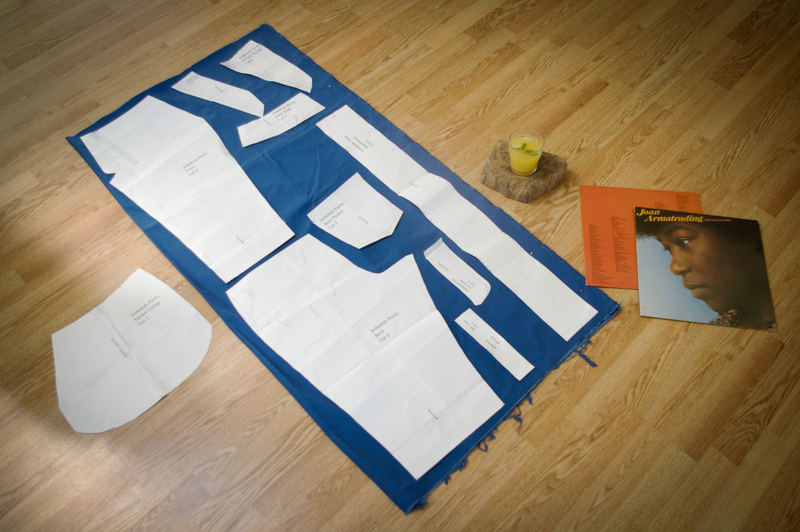 If you haven’t already assembled your pattern pieces or determined the size you will use, refer to these past posts for some tips and tutorials. Before cutting out your fabric, be sure to wash and dry the material (using the same temperature and settings as you will be using when washing the finished shorts). 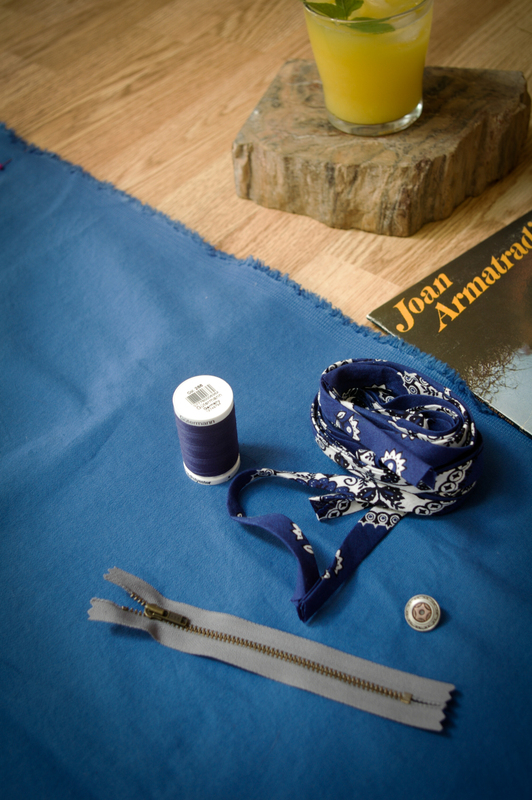 Iron your material and lay it out, folded in half with right sides together and the finished selvages lined up. I like to pin the selvages together so that I don’t have to worry about the fabric shifting and cutting the pieces out off grain while I cut through two layers. 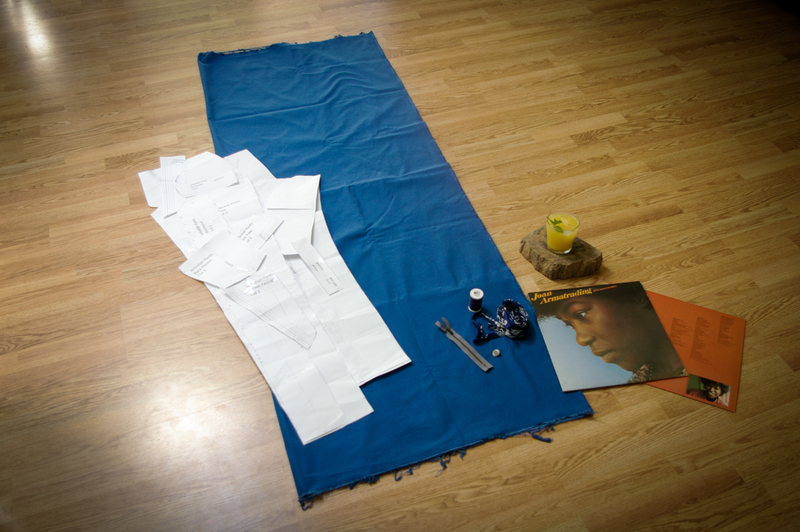 Gather together your paper pattern pieces, your scissors or cutting blade and mat and of course some good music and a refreshing drink. 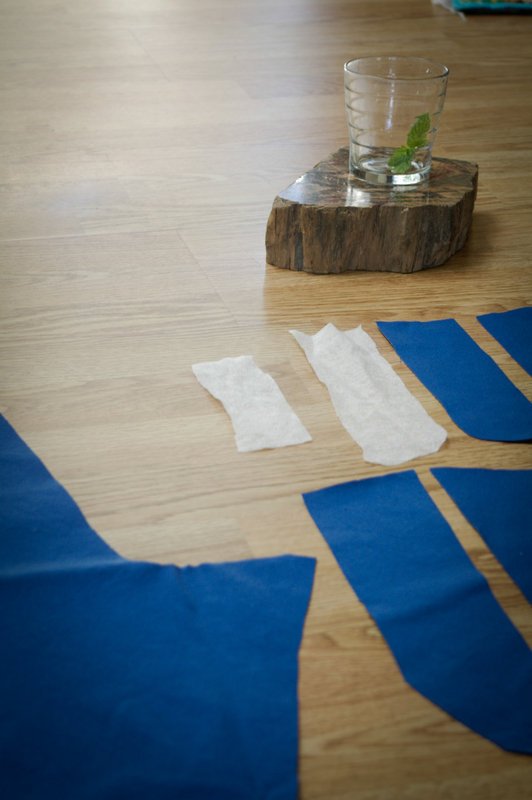 Now that we have everything gathered together and we’re pleasantly refreshed and focused, lets discuss what method we’re going to use to cut out our pattern pieces! I’ll show you two options that I regularly use and discuss the advantages and disadvantages of each. Option #1 is to trace your pieces and transfer markings using chalk (or any sort of marking device – a pencil works nicely if your fabric isn’t too dark). 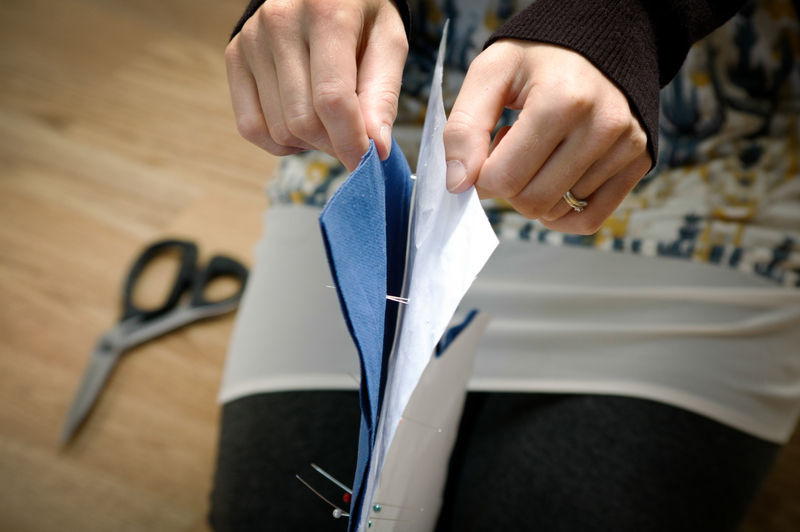 Option #2 is to pin your pieces to the fabric and cut around them while the paper is still attached. I often transfer my markings using pins if I am choosing to use this method but you could also use chalk just for the markings. Either way I decide to approach cutting out my fabric, I first lay out the pattern pieces on my folded fabric. Here they are (pictured below) laid out according to the diagram in the Jedediah Pants instruction booklet but feel free to save fabric by experimenting with different layouts. We were a little generous in our estimates in the instruction booklet because we hate the thought of someone coming home with 10cm too little fabric! I have set the pocket lining piece aside to be cut out of my pocketing material and will also cut interfacing pieces for the waistband and zipper shield after cutting them out of self fabric. Once I am happy with the placement I cover the pattern piece with all manner of solid objects (much more fun and certainly cheaper than buying pattern weights!) so that it will not shift while I am tracing. 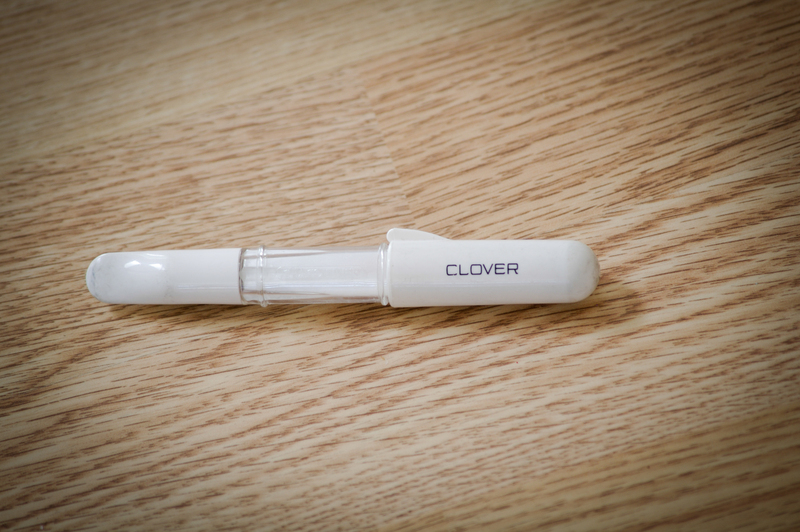 To trace the pieces I use one of my favorite sewing tools, the spectacular Clover chalk pen. Oona has perfectly described how handy and indispensable these little tools are over on her blog. Check it out if you have any doubts – she echoes my thoughts and amazement exactly. To even further prevent possible fabric shifting (can you tell I really hate twisty pant legs?) I like to pin around the outside of the pattern through both layers of fabric so that the only thing I have to worry about while tracing is creating a smooth line. Once I’ve traced the entire outline and the markings, I set the paper pattern piece aside. In the photo below you can see how I transfer notches using chalk. To transfer the two notches at the top of the fly facing I simply drew a line outwards (away from the pattern piece) exactly where the notch was on the paper pattern. 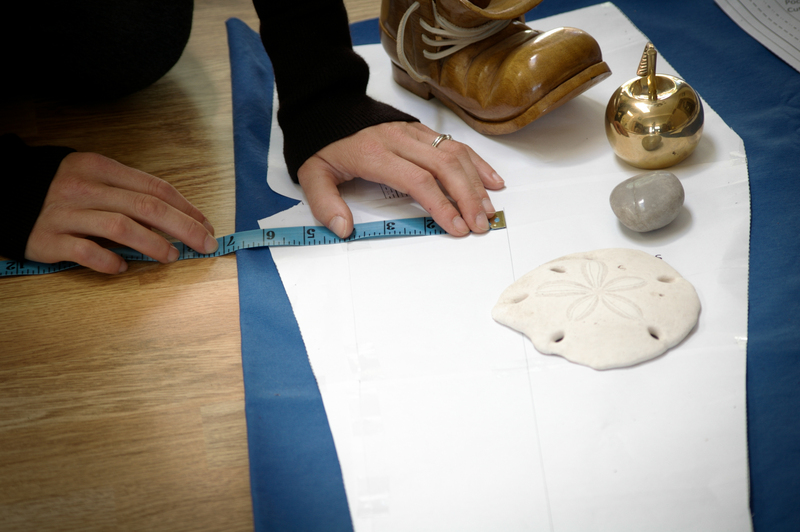 When the paper pattern was removed I extended the chalk line down into the pattern piece for 1/2″. That way I don’t have to cut into the paper pattern at each notch or awkwardly fold up the paper to draw the little notch line. I also wrote a big, clear “X” at the zipper placement dot by sticking a pin up through the fabric and the pattern piece, removing the paper pattern piece and then lining up the chalk “X” so that it’s center is where the pin is coming up through the layers. Then I removed the pin and Voila my zipper dot is marked! 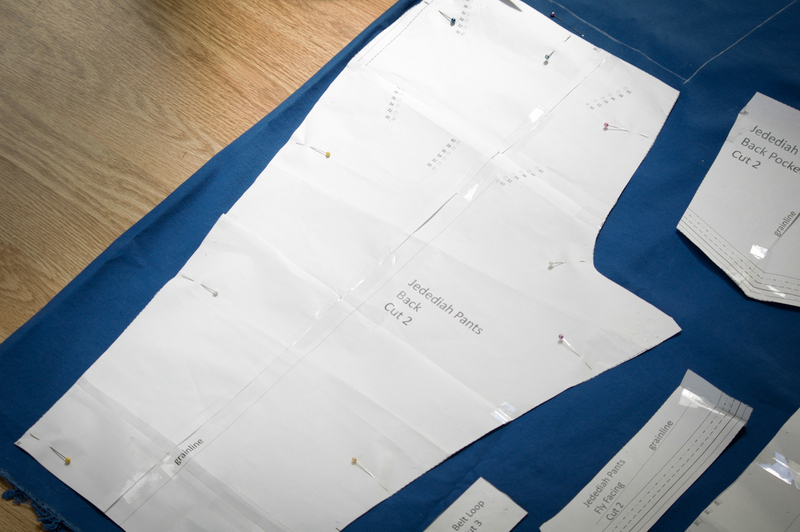 Make sure to transfer all notches and markings to the other side of the folded fabric too so that you will have them when you cut out and separate the two pant legs (and other pattern pieces). I tend to forget this step and it is frustrating and time consuming to have to line up the paper pattern piece with the unmarked fabric piece to transfer the markings when I am in the middle of sewing the garment. 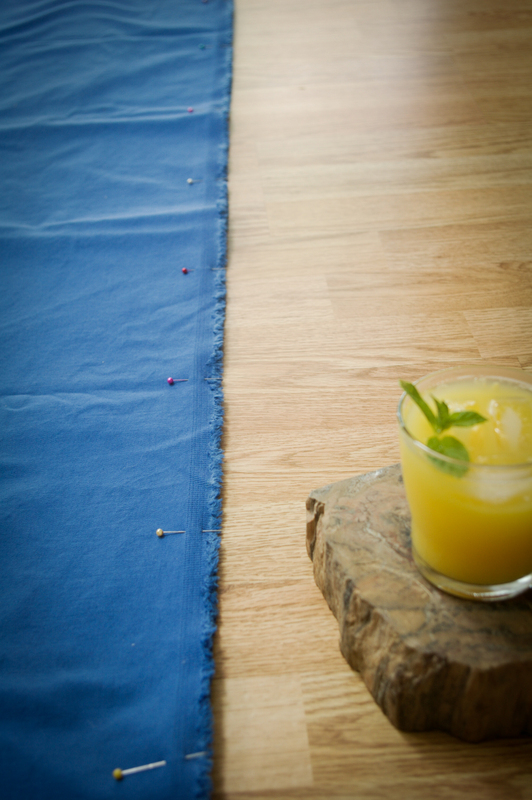 Now, if you were using Option #1, simply cut along the chalk outline through both layers of fabric. There is no need to cut the notches (and it is best not to if you are planning to follow along with the sew-along and use flat fell seams – the whole seam allowance is needed to make these). If you are cutting out your pattern using Option #2, line up your grain lines using the measuring trick already mentioned and then pin the pattern pieces down through both layers of fabric. 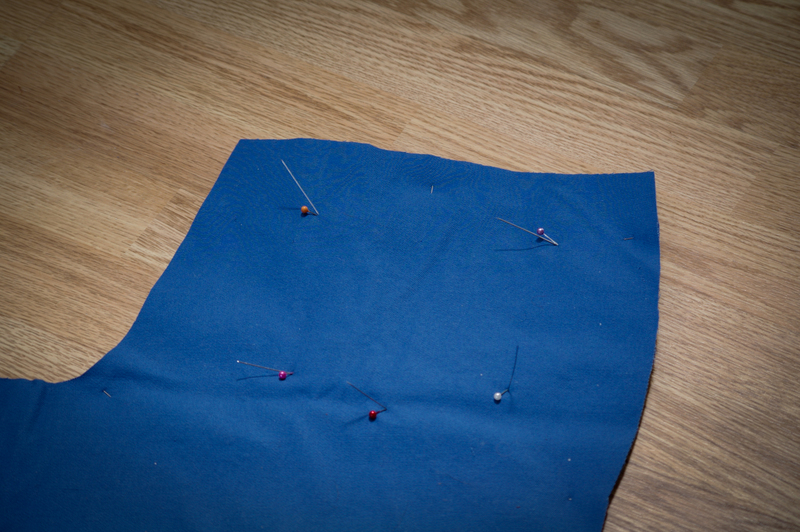 Since the fabric I am using is a mid-weight Denim with a grippy texture, I didn’t need to use very many pins. Also, the stiffness of the pattern paper (since it was printed and taped together from a PDF) makes it sit nice and flat without the crinkles and folds I find tissue paper to be prone to. And then I cut out my pattern pieces, carefully avoiding the paper pattern (since I love my nice sharp new scissors so much and would hate to dull them on pins and paper!). When I’m choosing to pin rather than use chalk, I often like to stick to pins to transfer my markings as well. This is the process I mentioned when I discussed transferring the zipper placement dot during Option #1, this time used to transfer all markings, including the pocket placement dots. I stick a pin down through the center of the dot that corresponds to the size I am using, through the paper and both layers of fabric. I then turn the piece over so I can see the tips of all the pins sticking up. 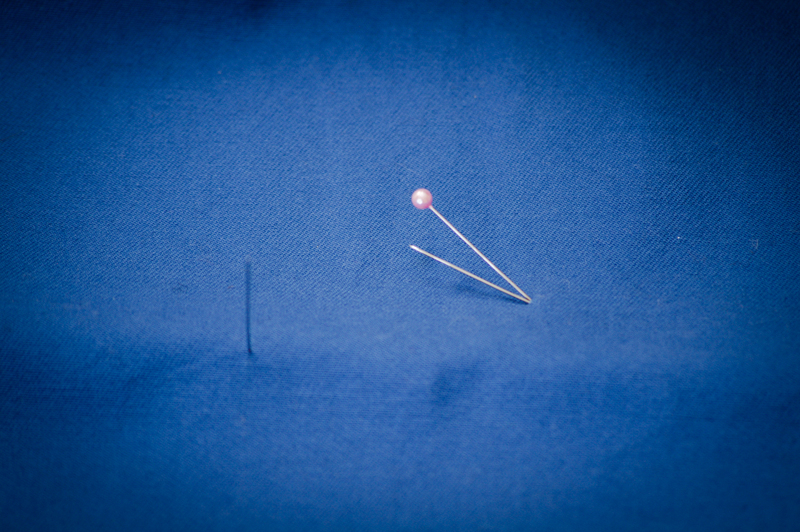 I place a pin going in the opposite direction exactly where I had stuck in the first set of pins. This removes the first set of pins I placed so I pick them out of the paper and stick them back in through both fabric layers. Then I pull apart the fabric layers so a set of pins stays with each layer, the head staying on the wrong side of the fabric and the sharp tips on the right side. 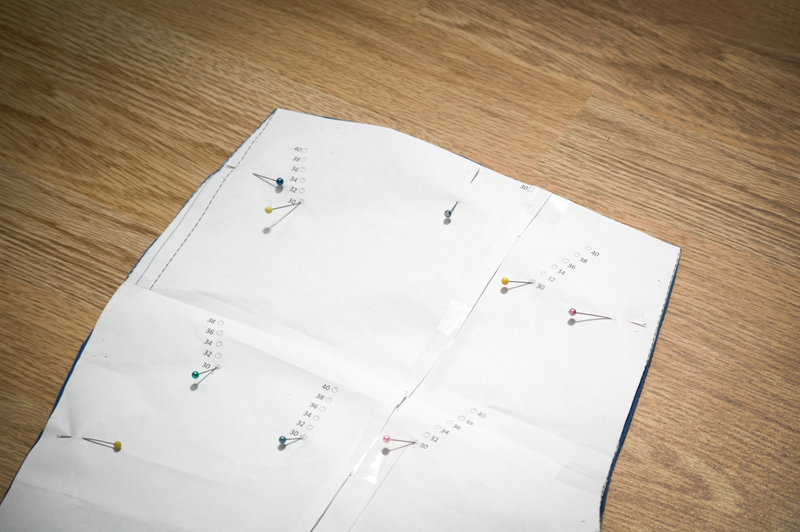 I leave the pins in as I sew and use them as ‘markers’ when I reach the step I need them for in the sewing process. 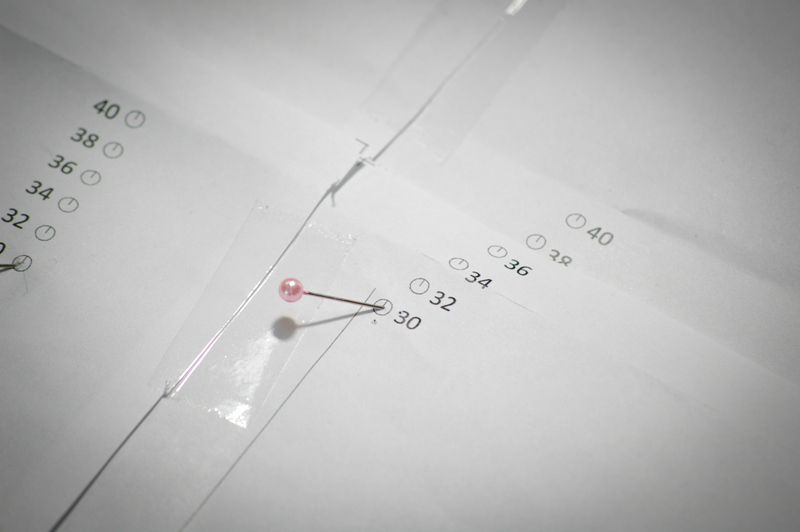 I know this process of pinning instead of marking seems long repetitive but I actually find it very fast and easy as my pins are already on hand and I don’t have to refresh my markings as I often have to with chalk (as they wear off when the fabric is handled). I also like how the pins serve as a quick reminder as to which is the wrong and right side of the fabric. Pros: Chalk (when using the Clover tool) is extremely precise and, since the fabric is not lifted very often from the tracing surface, does not lead to the fabric shifting. It is easy to cut exactly on the inside of the chalk mark so that the fabric piece does not end up slightly bigger than the paper pattern piece. Chalk is a fast and easy way to mark notches. Cons: My chalk tends to rub off quickly and I often don’t notice this is the case until the marking is completely gone (this can get awkward if I am about to insert a zipper and no longer have a zipper placement notch! Chalk also adds a little extra time because tracing tends to take me a bit longer than pinning. Pros: Since I already have pins on hand (all the time) I don’t have to rummage around for my chalk…which I always seem to lose 😛 It is very fast and I often like to leave my pieces pinned to the pattern pieces so it saves time later on in the sewing process too because I don’t have to examine the stray pieces of fabric trying to figure out which piece they are and which is the right and wrong side. Cons: It is less accurate because the fabric can shift slightly when being pinned and also later when cutting (with not chalk outline to ensure I cut correctly despite shifting). The fabric pieces could potentially end up slightly bigger than the paper piece…especially if I’m very anxious not to cut paper with my new scissors! 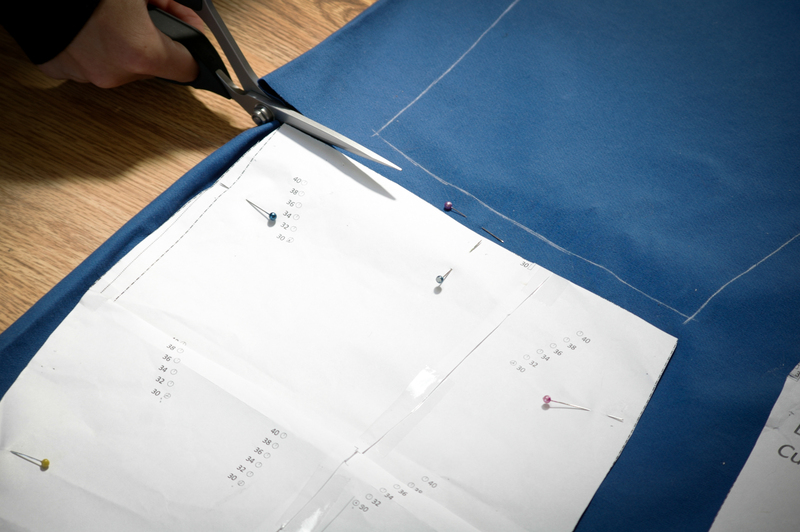 Now that we’ve analyzed these two cutting out processes, choose the one you like best to cut out your fabric pieces from your self fabric and don’t forget to cut out the necessary interfacing and pocket lining using the same process. Now we’ve finished cutting out our fabric, we have a nice tidy pile of pieces ready to use when we start sewing tomorrow – wahoo! Categories: Jedediah pants, jedediah shorts, Jedediah Shorts Sew-along | Tags: sew along | Permalink. No worries, you are welcome to follow along on the sew-along whenever you have pants to sew as we will be keeping it accessible on the blog indefinitely! Good question about the interfacing: the instructions are referring to the left side of the pants if you were wearing them. 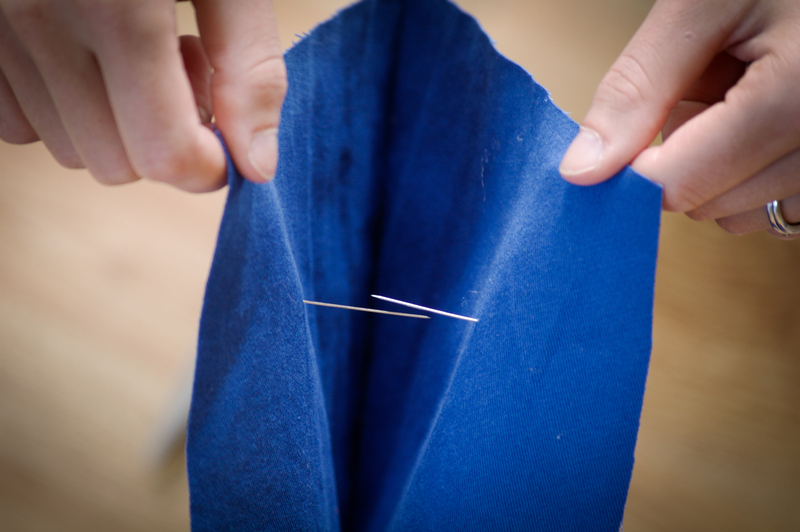 So apply the interfacing to the wrong side of the fabric on the curved fly facing extension. But really, if you are unsure about which pant piece to apply the interfacing to, it really wouldn’t hurt to apply it to BOTH fly extension pieces! It is just used to make the fly extension a little stiffer so that it is less likely to buckle and fold like they commonly do after wearing and washing a few times. 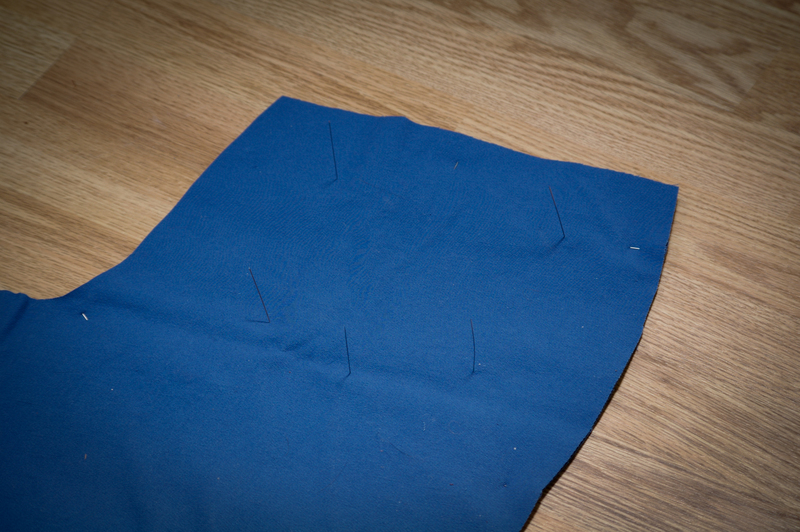 I have sewn Jeds without remembering to add this interfacing and it still works great. Feel free to ask any more questions you have along the way! Good luck with your first pair of pants! I made a pair of pants once that the fabric was off-grain (not square) & I didn’t know how to fix it. I just brushed it off and cut them out. And now I have a pair of twisty-legged pants. So it does pay to make sure the grain is perfect before cutting out. Yup it does 🙂 My friend at design school somehow ended up with one leg so twisted on one of the pairs of pants in her final collection that she had to rip apart all her careful flat fell seams and replace the whole leg…not fun! I’m just trying to adjust the Jedediah pattern for my very slim boyfriend, for whom the smallest size is still a little too big. According to the quick toile I made, I think I need to take out a tiny bit of width in the back, and a bit more in the front. (Or tell the guy to eat more!) The back should be easy, I’ll just cut a little wedge out of centre back, on both the yoke and the back leg. But I’m a little unsure about what to do with the front. I think that I need to take off some width at the sides, but I’m a little confused about which pattern pieces I’ll have to adjust, and how exactly, so that everything will still go together correctly, with the front pocket openings and all that. Or should I adjust the pattern in the centre front? But then how do I deal with the fly? Do you have any advice on how you would do this, before I make a mess of things? Thank you for doing a sew-along! I might actually finally make the pair of shorts that I’ve promised my boyfriend for a while now! Thanks for bringing up your question! Have you seen the tutorial that I posted the other day for grading between sizes? 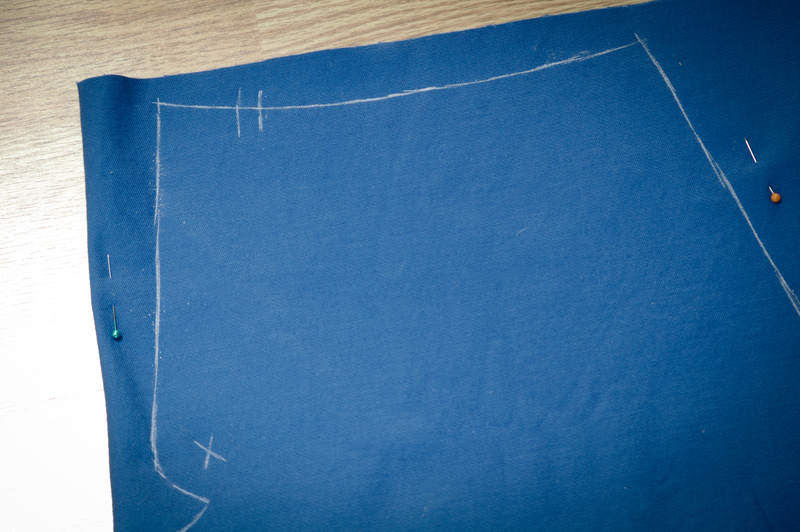 In that post I’ve included a diagram of the front of the pants and the pocket lining piece where I’ve shaved off width only at the bottom of the pieces and kept the waistband at size 40. You could try something similar but adjust the top of these pieces and the waistband to make the entire front smaller. The only other pieces you would have to worry about are the two facing pieces…since these are just top stitched to the pocket lining you don’t really need to grade them smaller if you don’t want to…you could just top stitch them as per the instructions and then cut off the excess fabric around the edges (this won’t affect the fit of the pants as the facing pieces are just cosmetic. 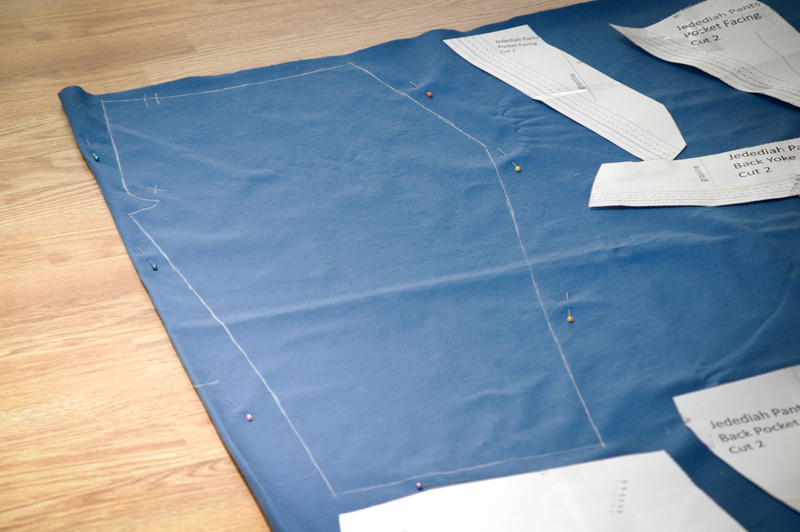 It is only the pocket lining piece that must match the curve of the side seam on the Pants Front). Did you try taking out the wedge at centre back when you made up your toile? I am a little worried that changing the curve of the centre back seam will affect the fit of the bum but if it is a minor adjustment, then maybe it is worth a try (especially if you’ve pinned or sewn your muslin to test out if it is a flattering effect). Adjusting the side seams and not the front seam will also change the fit but if it is only a small amount, you will probably be all right – I would REALLY recommend making up another muslin with these changes though! So to sum things up: To grade the front smaller at only the side seams, you will need to adjust the Waistband, the Pants Front, and the Pocket Lining piece. Optionally you could adjust the two pocket facing pieces. I hope this helps! And I hope you realize that this isn’t the absolutely correct way of doing this…it is just a suggestion that may help if you only have to shave a bit of width off the front 🙂 Please make another muslin before cutting into your fashion fabric as I would hate to give you bad advice and ruin your nice fabric! Thanks so much for the quick and comprehensive reply! I read the tutorial for grading between sizes, but it’s a bit of the opposite thing from what I need, and I’m already at the smallest size, so can unfortunately not grade down by blending the lines to another size. And then it’s mostly just the front that’s wrong for him, the back is pretty much fine as it is. In any case, I’ve adjusted the toile by shaving off a little width in the centre back and a little more at the sides of the front pieces, and the fit is much better now! I’m sure it won’t be perfect, but I’m not going for perfect on the first pair. I’m going for “at least as good as RTW”, and since most RTW trousers won’t even stay in place on him without a belt, that isn’t that much to ask for, ha! Next step: try to adjust the pattern pieces like I did the toile, add a little width to the legs (he’s somewhat particular about this), and then try to catch up! Good luck with adding width to the legs and sewing up the real version! In any case, I’ve cut out all the pieces for my first pair and am playing catch-up with your tutorials! Thanks so much for the detailed photographs! I was a little daunted by the pattern instructions (being both a beginner and a visual learner), but your sew-along has given me the confidence to try anyway!